Minimum age is 14. Under 16's must be accompanied by an adult. You must bring this ticket for entry. The Producer reserves the right to deny entry if you fail to present a valid ticket. Ticket is only valid for date and number of people printed on it. 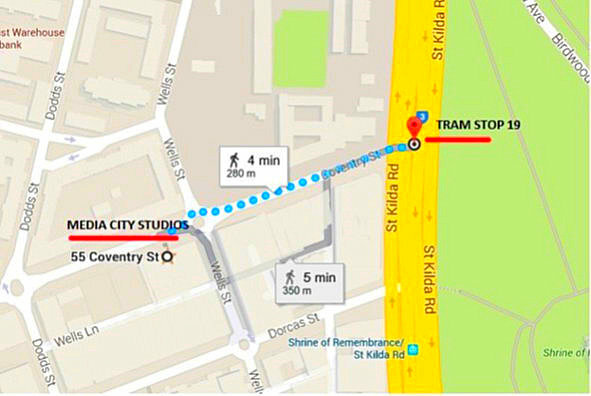 You must arrive at the Audience Entry (Marked on map) at the time on your ticket. Alcohol, illegal substances are not permitted. The Producer reserves the right to deny entry to persons it presumes may be intoxicated or under the influence of any illegal substance. Please do not bring Banners/posters with you as they cannot be taken inside the studio. Please do not bring large bags or luggage into the studio. By accepting this ticket you agree to stay for the full duration of the show filming as per the session times stated above. Entry is not guaranteed and remains at the sole discretion of Fremantle Media. Family Feud takes your attendance to mean you have read and agreed to the full terms and conditions. This Ticket is NOT TO BE SOLD OR OFFERED FOR SALE, REPRODUCED OR DUPLICATED. This Ticket is not redeemable for cash and cannot be replaced if lost, stolen or destroyed. Energy in Studio audiences are an important part of any game show so be ready to applaud, laugh and enjoy yourself! Have Dinner / Something to eat before you come in as food is not allowed in the studio, it is best to have something to eat before you arrive. Wear something bright and colourful and try to avoid tight patterns and large logos; we want you to look good when the cameras catch you cheering on the competing families! Please ensure you are wearing closed toed shoes as thongs and sandals etc are not permitted. A reminder that you may be seen on camera as part of the studio audience at some stage during the recording, if you have any concerns please speak to the audience coordinator upon arrival. While we sometimes understand that it is not possible, it is best to get to the studios via public transport. As most car parks nearby close prior to the end of recording, we suggest that if you come by car you take advantage of any unmetered surrounding street parking or park at local car park. If you are coming by train, alight at Flinders Street Station. Please make note of signage when street parking and hourly costs and closing times when entering car park structures as they are subject to change. There is only limited parking available in streets surrounding NEP Studios and public transport is highly recommended. Limited street parking is also available in Dorcas street & Wells street, please check parking signs for details. (c) The Producer has no obligation to make or exploit the Program, or to use me in the Program and I will not bring any claim against the Producer for loss of opportunity in relation to theProgram. (b) to use, edit, modify, alter or exploit in any way the Recordings at the Producer's discretion and use my name, likeness and voice and any biographical details (which includes, without limitation, any â€œpersonal informationâ€� as defined in the Privacy Act 1988 (Cth) (the "Act") or otherwise ("Personal Information"), photographs and recordings of me separately from or in conjunction with the Program or the sponsorship thereof in all media (now known or hereafter devised) and formats throughout the Universe without restriction including without limitation on Program-related web-sites or other online media and in advertising, publicity, sponsorship and exploitation material and without any payment to me and I will make no claim against the Producer or against any third party for such use. I irrevocably consent to the Producer (and persons authorised by the Producer) transferring Personal Information about me throughout the world to related body corporates and third parties associated with the Program and to use the Personal Information for all other purposes contemplated herein. (c) Because of the broadcast of the Program, including any statements made by any host, judge, contestant, staff member or other audience member; or (d) otherwise arising from any effects or results of my participation in the Program. Without limiting the foregoing, I agree that my participation in the relevant episode/s of the Program as an audience member (including any related travel in respect of such attendance) is entirely at my own risk and at my own cost. (f) The date and time of the recording of the episode of the Program to which the Ticket relates is subject to change without notice. (g) I may be standing throughout the duration of the program. (h) The ticket does not guarantee entry to the Program audience if the ticket holder does not arrive at the given time and/or the studio is at maximum capacity. The Producer reserves the right to deny any ticket holder entry to the studio at its sole discretion.